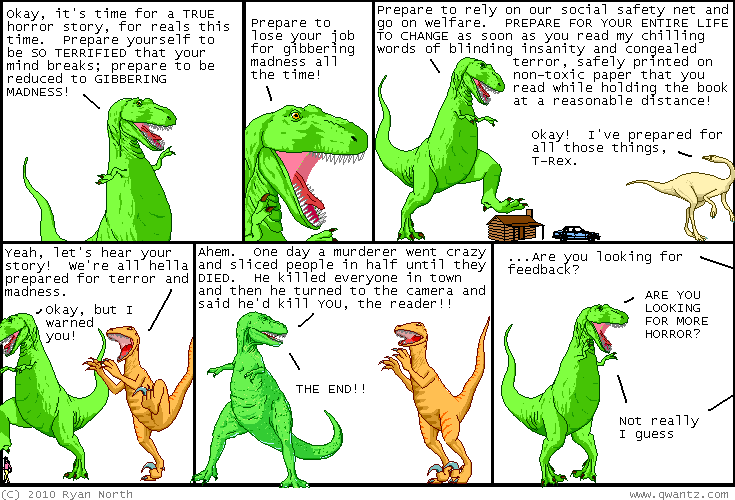 Dinosaur Comics - July 30th, 2010 - awesome fun times! July 30th, 2010: YOU GUYS! At San Diego I also saw some AMAZING T-Rex and Utahraptor cosplayers named Emily (Utahraptor) and Ambrose (T-Rex). Ambrose's sister tailored the T-Rex's trousers and suit and Emily's mom made her dress! It was amazing, and then I put on the T-Rex head and this is what my world looked like. TOTALLY EXCELLENT. Great work, guys! We posed for a few photos and people kept coming by insisting that they take a picture too, which is the mark of a great costume. Ambrose's T-Rex was wearing a bow tie (nailed it!) and Emily's Utahraptor even had the foot claw. It was the best ever; I'd never even imagined people dressing up as T-Rex and Utahraptor before SDCC and I am forced to rate it FIVE out of a possible four awesomes! One year ago today: three worse reasons for donating sperm than the sense of mystery: "i was told there would be pizza", "my freezer at home is just about full", "well, the apartment's already rotten with the stuff anyway"